Shop update: The Royal (window) treatment! I had a bit of fun with the window at the Table Tonic shop yesterday (this visual merchandising business is fun!). 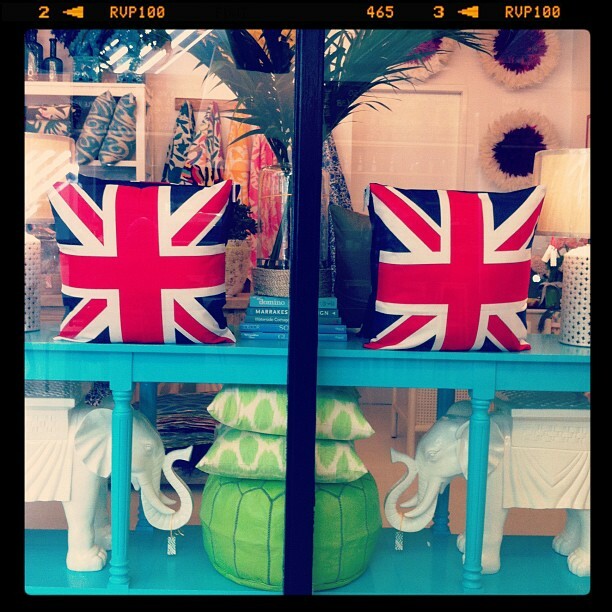 The Union Jack cushions have been called to attention and it's looking and feeling rather Royal! PS The Union Jack cushions were, until recently, our number one seller and I just noticed they've been bumped off the perch by these! I bought the console table (buy it here) from the divine girls at Complete Pad (they were so helpful and sweet - Hi Gemma and Rhiannon) along with the gorgeous Elm console in the middle of the shop AND my soon-to-arrive desk chair! And after flicking through Mr Tonic's giant Dulux swatch book, I found thee perfect powdery turquoise to paint it - Dulux "GLIMPSE". We have love in the house. Have a beautiful long weekend, and if you're in Sydney, come down to the TT shop tomorrow (Saturday) and say hi! Shop 6, 20 Avalon Parade, Avalon. Ph: 0414-508-473.